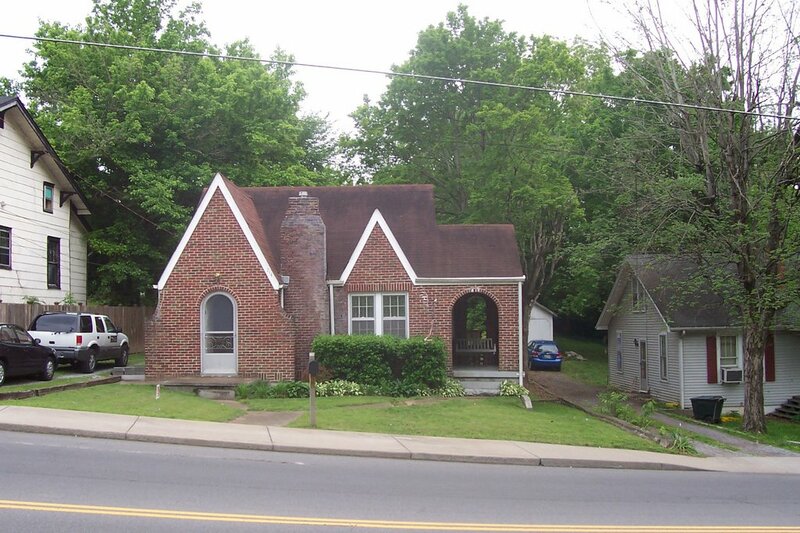 It's official--Steve and I closed on the house today--we have the keys in our possession! 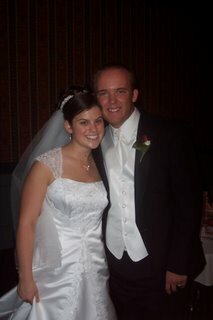 We had been warned about all the glitches and drama that can go along with buying a house, but God really blessed us. The entire process was incredibly smooth and painless. 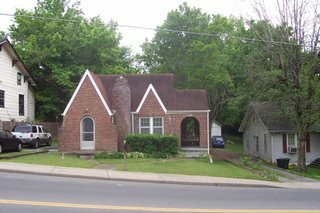 We can HIGHLY recommend our realtor and mortgage broker--we loved working with both of them! We plan to spend the next couple of weeks making some repairs/painting/cleaning/etc, and we'll be moving gradually--we don't have to be out of our apartment until August 1. I didn't expect the last little birdie to leave the nest so soon. Came to the computer to post the previous pictures, and when I went back out to the living room, I saw that he was gone. 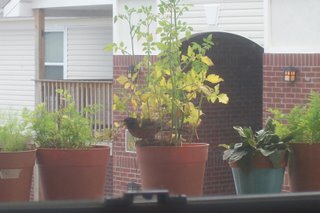 I think I saw him hop around the corner of the building, but my camera doesn't have enough zoom for a good picture. 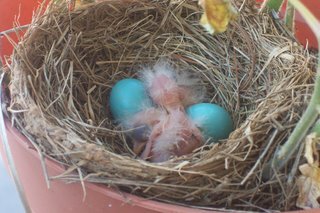 He had to grow up fast--the last egg didn't hatch until two weeks ago tomorrow, so he didn't get the full two weeks that his siblings did. 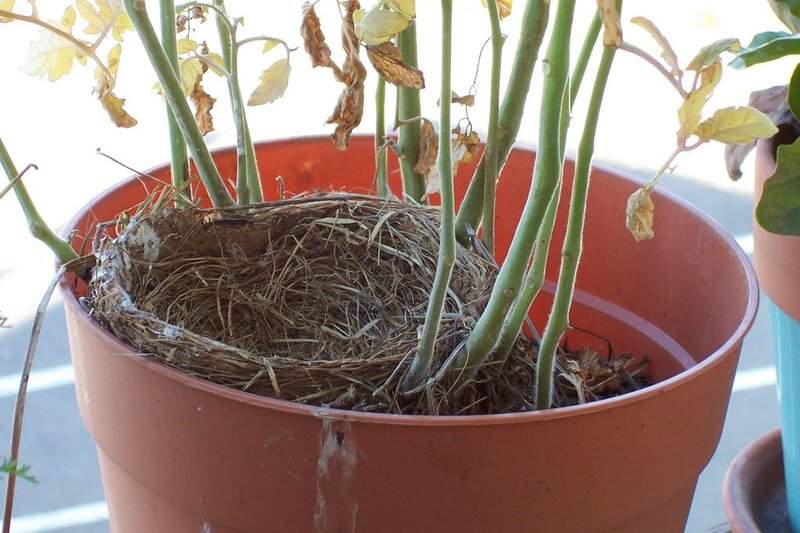 At any rate, our little nest is empty again and I'm going to miss watching the robins! Last baby left: "Hey, wait a minute...guys? ...Guys?" He's just looking around, not sure what happened, and thinking that's a long way down. 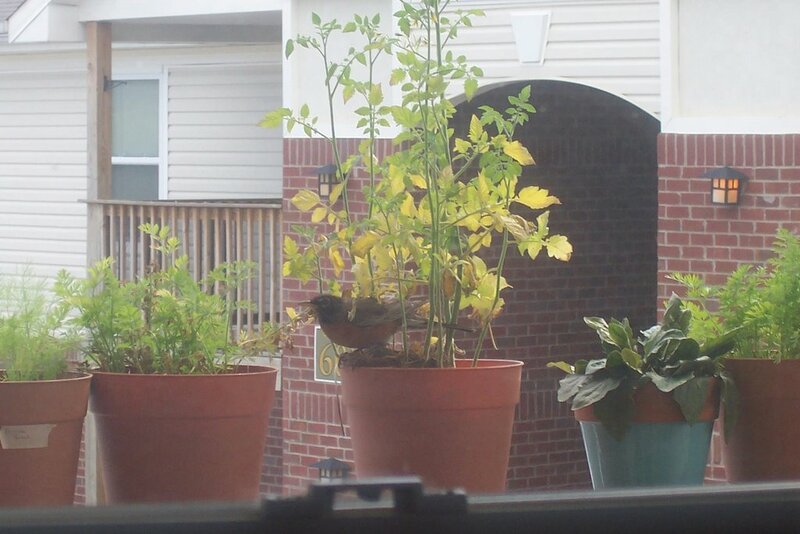 He's been chirping all morning, and Mama has come back to feed him once or twice. 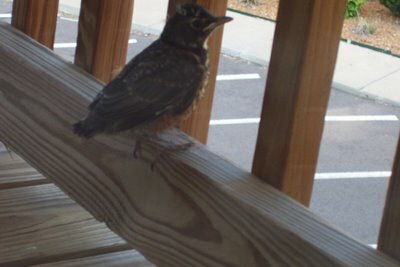 I tried to sneak out on the balcony and get one last picture up close rather than through a window--but he's aware enough now that he freaked out, and I was afraid I'd scare him into falling out of the nest. So I got right back inside. This photo was the best I could do. This morning I happened to be in the right place at the right time and actually watched one of the two remaining babies leave the nest! He hopped around on our balcony for a few seconds, and I grabbed my camera. He was right in front of the door, so I got down on his level and tried to take some photos (sorry for the terrible quality--but I was excited, I was shooting through a window, and I was shooting around mini-blinds that can't be raised because they're attached at the bottom of the door). When he looked up and saw me on the other side of the window it literally scared the poop out of him :) He then hopped up on this ledge, and right after I took this shot, he glided down to the ground! We're back down to only two birdies! 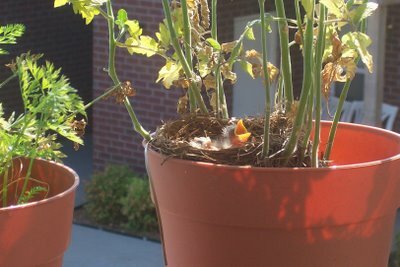 Yesterday afternoon we discovered that one of the babies has left the nest--successfully, we hope. 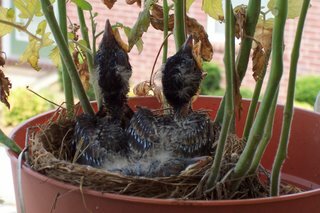 I read somewhere that although they leave the nest after two weeks, they can't fly at first. But we didn't see any sign of the baby on the ground anywhere--so we hope he made it okay. 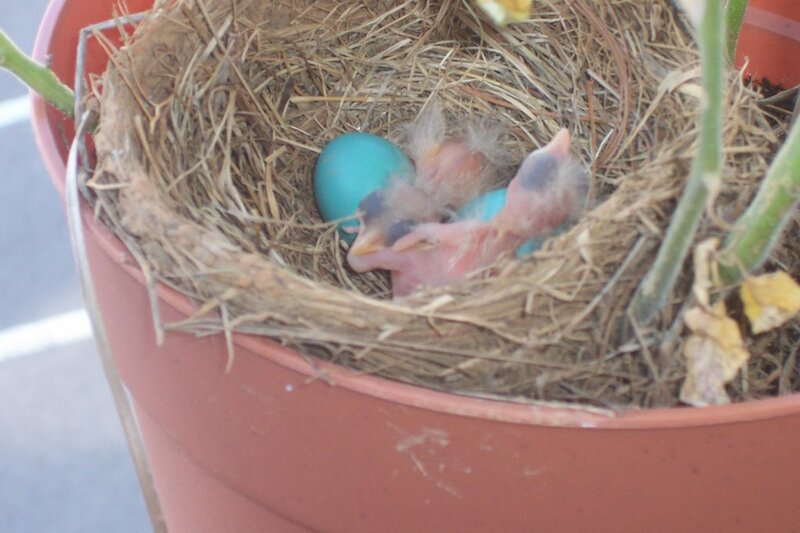 Today was two weeks exactly since the first one hatched, so maybe he was ready! 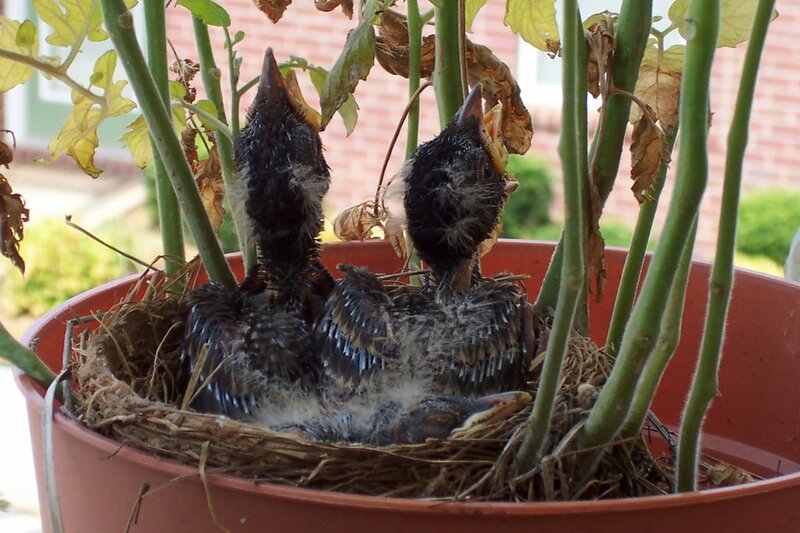 As you can see, they've outgrown the nest--one has pushed the other into the surrounding pot, presumably because it's so hot outside and they're squished if they both sit in the nest! Get Away From Our Babies! I love this shot of the whole family. Papa has one of the worms Steve put out, ready to feed the little ones. I imagine Mama is looking at him saying, "You're not even going to bite it into smaller pieces for them?!" If you click on the photo to make it larger you can get a good idea of just how big these worms are. Shortly after this Mama and Papa were fighting. It was pretty funny to watch, but I wasn't able to get any good photos. Wish I would have thought to switch to my camera's video setting--I always forget about that. There's mama with some food! Finally! We're starving! It's no wonder they grow so fast since they eat so much. 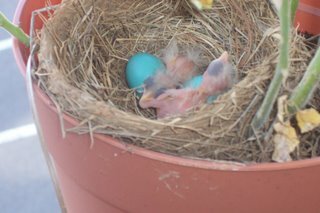 Mama and Papa Robin have been BUSY! 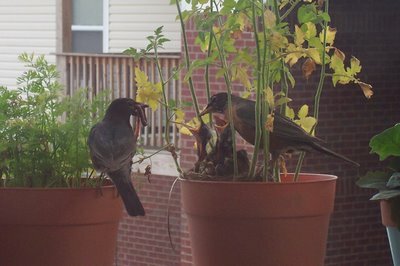 Our balcony is a constant flurry of activity, with the parents flying away to find food and returning to the wide-open beaks of their always-hungry babies. 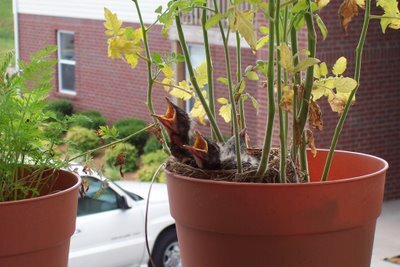 And ooh, do they ever get mad when Steve goes out to water the plants! He does it as quickly as possible, but that doesn't stop them from squawking and dive-bombing him. 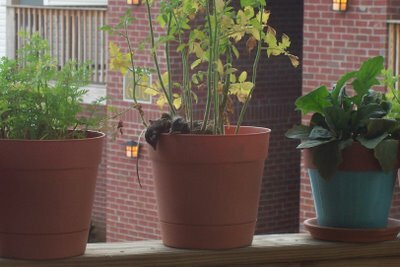 We felt sorry for the hardworking parents, and the fact that we have to bother them to take care of our plants--so we decided to buy them some worms. 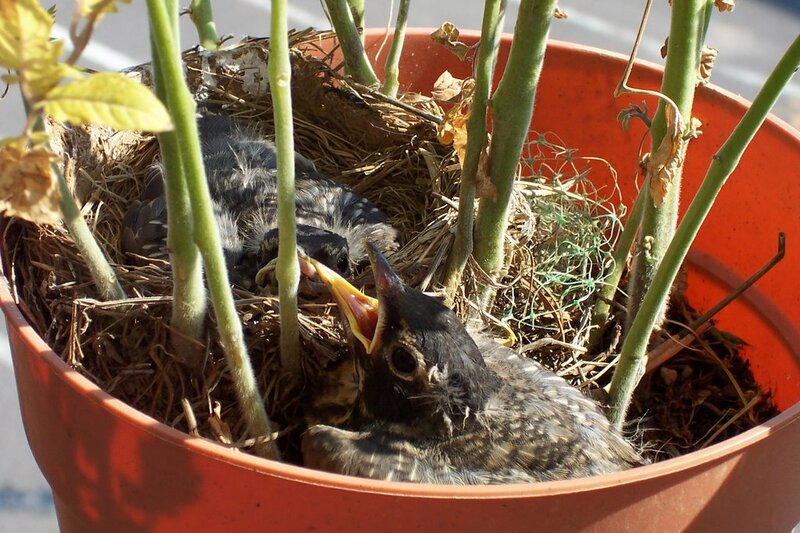 Last week before we left, Steve emptied a tub of nightcrawlers on a paper plate and left it outside the door--but all day, the robins didn't want anything to do with the food supply, plentiful though it was. We decided maybe it was a little too close to the door where we come out--and they weren't quite that brave. So Steve moved the pile of worms (YUCK) to a pot just a couple of pots down from their nest. Within just a minute or two, one of the parents snatched a worm and flew down to the sidewalk. What ensued was hilarious. Steve and I were cracking up as we watched the robin thrash the worm all over. He didn't peck it to death, he just held it in his beak and whipped it around again and again--that worm never knew what hit it! Then when it was sufficiently dead, I guess, the robin stopped and slurped the entire worm down like a piece of spaghetti. Unfortunately we had to leave, so we didn't get to see him come back and feed the babies. When we got back and saw how much the babies had grown, we got some more worms. Steve has been rationing them to the robins three or four at a time. 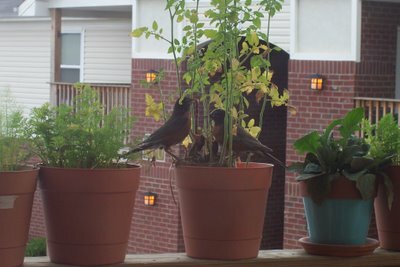 It's funny to watch--after he goes out there and gets squawked at, he holds up the worm so the protective parents can see, then puts it in a pot. (Notice I am NOT the one touching the worms.) And as soon as he comes inside, they don't hesitate to grab it. We couldn't believe it when the entire first worm was fed to just one of the babies! We thought surely the parents would bite it into smaller pieces--it was huge, and the worms they typically get are tiny--but no, one hungry baby gulped the whole thing down. The adorable wide-open beak of a hungry baby robin! 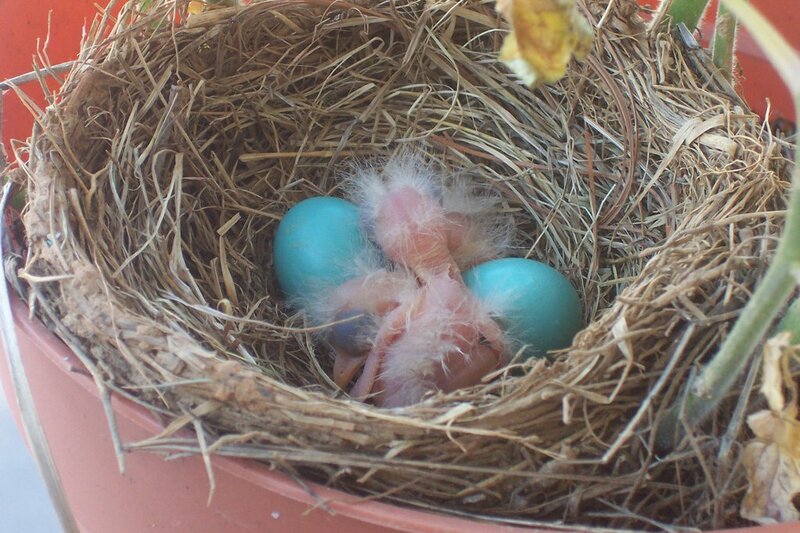 Birdwatch: Two Hatched, Two to Go! Last night when we got home from church we hated to disturb them, as Mama was sitting on the nest. We try not to go out there when the parents are around, if possible. 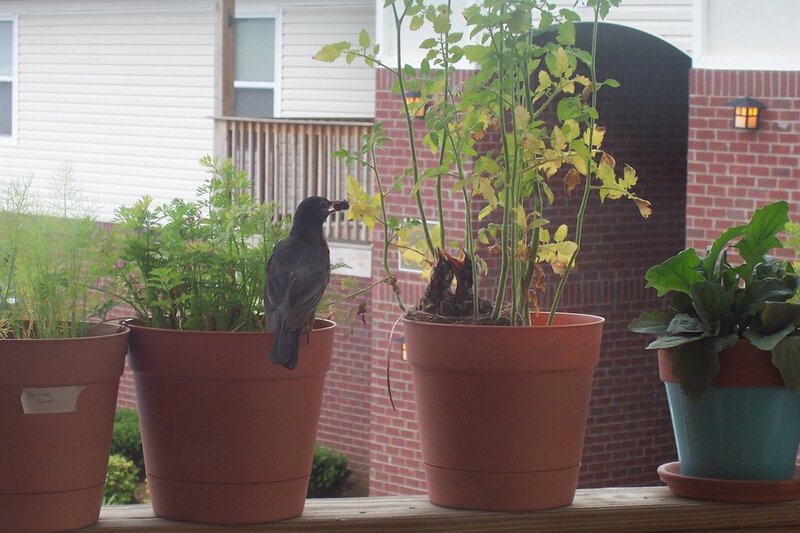 But our plants desperately needed to be watered, so we moved slowly and quietly, trying not to startle the bird. 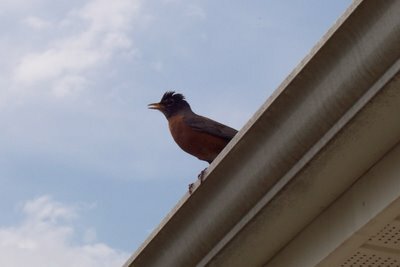 I couldn't believe how patient and brave she was before she finally flew away--I was about a foot away from her nest and still she just sat, watching me. She looked scared and I felt terrible! Steve carefully watered around the nest while she was gone, and I peeked in. 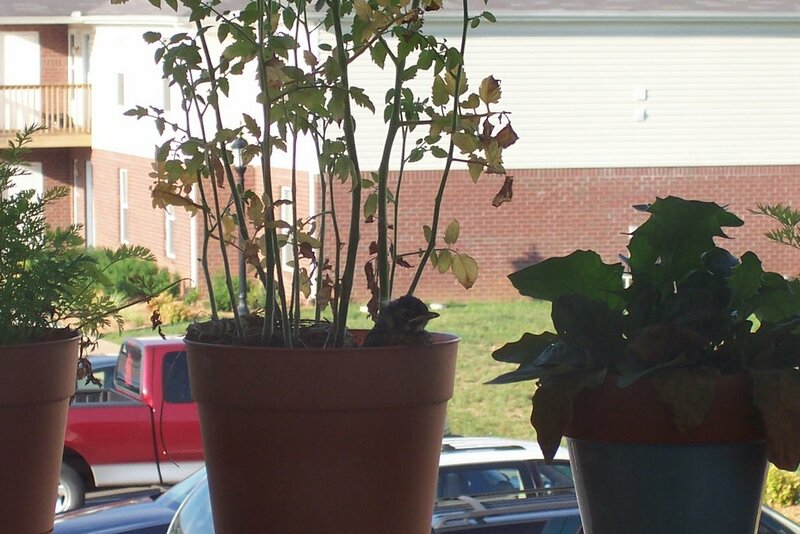 Right on schedule: One tiny robin was in the process of hatching. The eggshell was still on its head! As I watched, it finally emerged...I won't lie, it was sort of ugly (pink and hairless), but in an adorable way...then it opened its hungry little beak wide and I fell in love. Steve still thinks they're ugly but I think they're breathtaking! I felt horrible for scaring Mama away while this was in process...we hurried to get the watering done and turn the light off asap so she'd come back. And she did. This morning I thought I heard tiny, high-pitched chirping but one of the parents was on the nest. I waited and was able to take these pictures once the parent left. Amazing! They're already getting fuzzy down, just since last night. Unfortunately they weren't opening their beaks while I was out there...I hope to get a picture of that soon. A few weeks after I ordered Songs for the Cross Centered Life, I was blessed to receive a copy of Worship God Live from Bob Kauflin at Sovereign Grace Ministries. One or the other has been playing in my car pretty much ever since. Worship God Live is the product of two special nights of worship at Covenant Life Church. When I opened the CD's liner notes, the first thing I noticed was an interesting statement about worship. 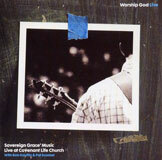 The project is called "Worship God Live" because it was a live recording of worship. But the note also says, "Worship is a life lived in grateful response to God, who sent His Son to save us from our sins. So take it outside the church doors. Everywhere you go...in everything you do...Worship God. Live." I love this double-meaning for the title, reminding us that worship is much more than singing along to a CD! All the songs are arranged primarily for congregational singing; the fact that they're sung by a worship team invites you to join in rather than drawing attention to an individual singer's voice/style. They're extremely singable and fun to learn. Some are exuberant and you can't help but tap your feet; others are more quietly moving. I find snatches of lyrics running through my head all the time--which is a wonderful way to help me center my thoughts on Jesus throughout my day. The collection also includes two great hymn updates: Isaac Watts' "O God Our Help in Ages Past" and William Cowper's "God Moves in a Mysterious Way." My only complaint is that a few of the songs end with extended ad-libbing. I have no doubt it probably worked live--moved by the greatness of the God they are singing about and to, the congregation is clapping and all the musicians are spontaneously, individually praising Him. If you were there, I'm sure it flowed and you wouldn't even notice. But on a CD, it doesn't quite work. The piano sometimes sounds a little bit chaotic, and it ends up being more distracting than worshipful. I find myself just thinking, "OK, next track." But it's an extremely minor complaint, and easily solved (just hit the "next" button). "at the end of the day, I’d rather be sitting in the midst of a quiet congregation that is singing rich, doctrinal truths than be jumping around with a lively congregation that is belting out shallow, man-centered songs. But why not pursue both? God doesn’t intend for us to have to choose. We can experience theological depth AND passionate expression." That's exactly what Worship God Live is. The theological depth of the lyrics deepens my understanding of God's character and deeds and my love for Him as I sing. I'm not just repeating shallow words; I'm learning and reinforcing truths about grace! And these compelling truths lead to passionate expression--the alive songs stir my heart to worship with joy and gratitude. You can hear song samples and order a copy of the CD here. I hope you'll check it out! I am fascinated by photography--and I love New York City. So when I saw this site (via this blog), I thought it was pretty cool. The project: Photograph one child from every country on earth. The twist: Every child must currently be living in New York City. The project is 2/3 complete, which is amazing to me that so many nationalities can be found in NYC! And the photographer has captured some beautiful shots. Steve had to go to Louisville on business this week, and since I don't work outside the home, I had the blessing of being able to accompany him on the four-night/four-day trip. And what a blessing it was! Though when we planned the trip, Steve intentionally selected a hotel with free internet access for me, I eventually came to the conclusion that this trip would be a perfect opportunity for me to "unplug." I spend far too much time on the computer and was sure it would do me some good to take a little mini-fast. Four days isn't much, but it was refreshing for sure--being away from y'all's blogs and therefore "out of the loop" gave me some needed perspective. 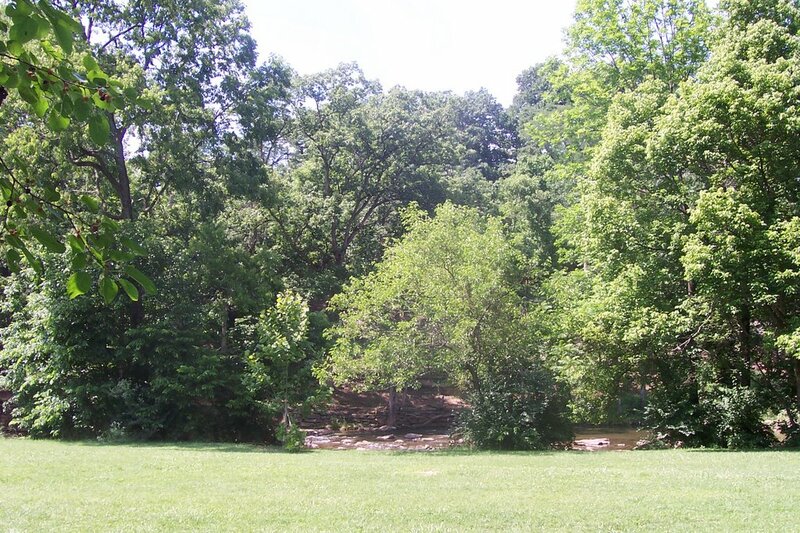 One of the blessings of the week was having extended time alone with God in an unfamiliar setting, free of all the patterns and distractions at home. I stumbled upon this beautiful location in Cherokee Park (after a lot of driving in circles--it was totally a gift from God, as I was growing impatient and slightly lost) and spent two different afternoons there, enjoying the sunshine and learning some valuable lessons. Much of my time was spent reading this fantastic book, which opened my eyes to just how far I've fallen short in my quest to be a godly wife. I may blog more on it soon, but for now, suffice to say that God taught me a lot about my own weaknesses and appreciating Steve's strengths. The trip included some nice relaxing time with my husband, of course. God smiled on us by sending Steve to a city that has both Qdoba AND Bravo. Seriously, what more could I ask for?? 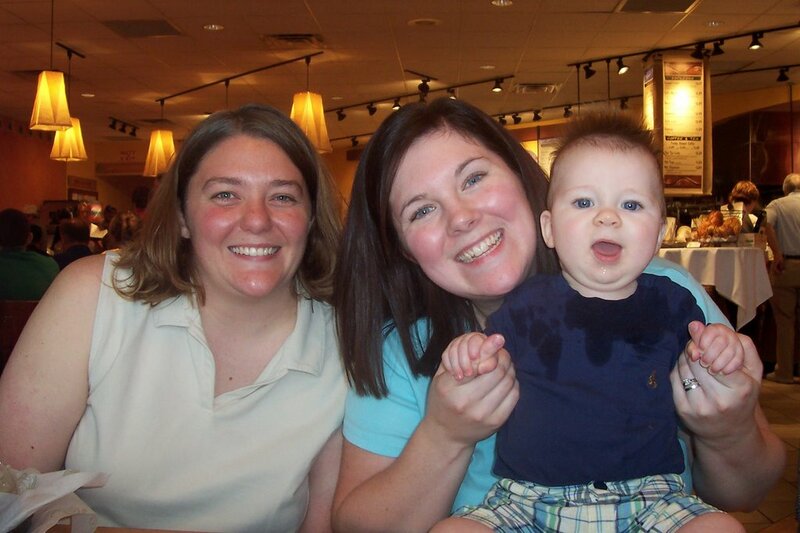 We enjoyed eating out (since his employer picked up the tab for all his meals! ), taking walks, shopping, watching a movie, etc. All in all it was a wonderfully refreshing time away. It's also good to be back home. Nothing like getting paid to blog, I always say. OK, I've never said that--but I'm saying it now. I'm filling the guest spot this weekend over at Nashville is Talking. For my regular readers who aren't from the area--which is the majority of you--NiT is a local aggregator sponsored by Nashville's WKRN (Channel 2, the ABC affiliate). They pay Brittney Gilbert to blog full-time, linking to--and promoting conversation amongst--Middle Tennessee bloggers. What a job! On the weekends they pay any interested local blogger to keep the conversation going. So from now until Sunday, I'm it. It's a whole different world than Lavender Sparkles--but if you're so inclined, stop by and visit. "Remember the greatest good of the Gospel is that God gives Himself to us. Salvation is not mainly the forgiveness of sins. The main thing is fellowship with Jesus. Forgiveness gets sin out of the way so that we can have this fellowship with God." Full post is here; summaries of all sessions are available on her main page. Check it out! I would really like to see some statistics on just how many marriages the IWU Chorale has produced. Anyone? I bet it would be astounding. I can think of at least 17 couples just off the top of my head, plus another five or so who are engaged. Whew! Had the privilege of attending another such wedding last weekend. Allison and Josh, two wonderfully sweet people who were a couple of years behind me at IWU, said "I do" in Fort Wayne on Sunday. It was a fun time of celebrating God's grace in their lives and catching up with several chorale friends. 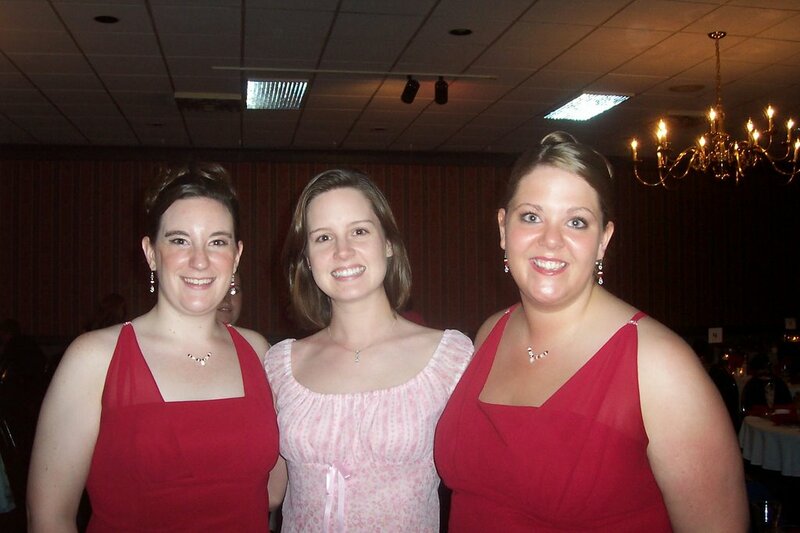 As I promised them, I'm including a picture of two beautiful bridesmaids--Aeron and Jaala. (Pay no attention to the ugly hair...it's a bad picture of my recent haircut :) These girls are precious to me and I loved seeing them, if only briefly. Now that just about all of the people I was close to at IWU have graduated, reunions will be even fewer and farther between, I am sure...but I am so thankful to God for the season He gave me with so many amazing friends.